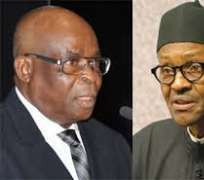 The Peoples Democratic Party’s Presidential Candidate, Atiku Abubakar, has warned President Muhammadu Buhari and the ruling All Progressives Congress to avoid throwing Nigeria into an avoidable crisis over their desperation to sack the Chief Justice of Nigeria, Justice Walter Onnoghen. Atiku in a statement issued in Abuja on Saturday through his Special Assistant on Public Communication, Phrank Shaibu, said the principle of separation of powers remains sacrosanct in a democracy irrespective of what President Buhari is being told by his advisers or the buttons they are pressing to forcefully remove the CJN. Atiku noted that the plot to sack Justice Onnoghen was a preemptive move against the bench in the face of imminent defeat and knowing the role that the judiciary plays in the final outcome of elections. Atiku said that their plan is to enable acting Chief Justice of Nigeria to sit on his election petition because he has seen the signal that he will lose the February 16 presidential election.